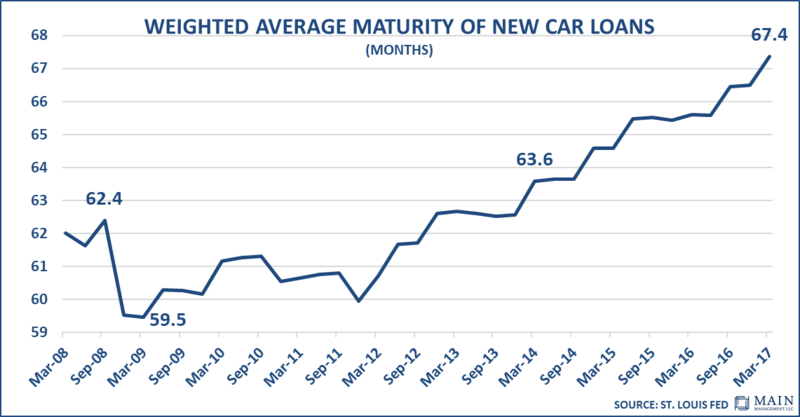 You are at:Home»ETF Strategist Channel»Are Auto Loans the New Subprime Systemic Risk? 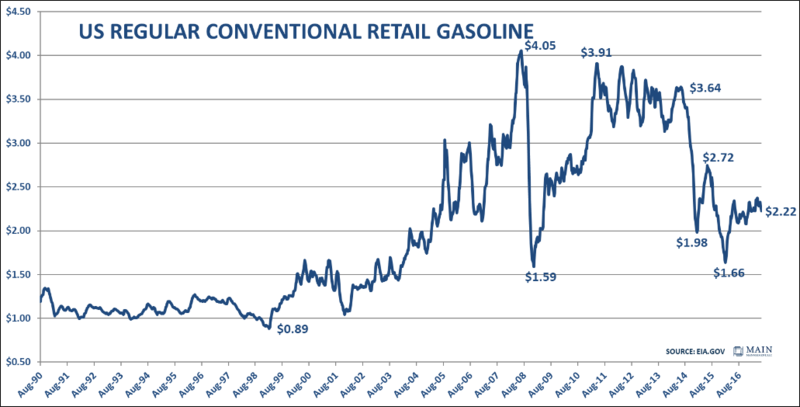 As clouds gather over the formerly surging auto sector, consider steering away. Americans love their automobiles. As a large capital expenditure, it is an important economic variable for the economy, representing approximately 3% of GDP, around 20% of retail sales, 10% of manufacturing output, and over 7% of manufacturing employment. The trends in autos have made a strong recovery from recession lows but have recently begun to weaken. A slowdown is unfolding in auto sales and in production which are headwinds for the economy. The charts below with our comments depict the current fundamentals. The 2008 recession had a pronounced impact on vehicle sales as the numbers were cut in half from 18.5 million units sold in July 2005 to 9.3 million units in April 2009. The auto industry enjoyed a sharp snap back of 95% to a level of 18.1 million units in November 2015. 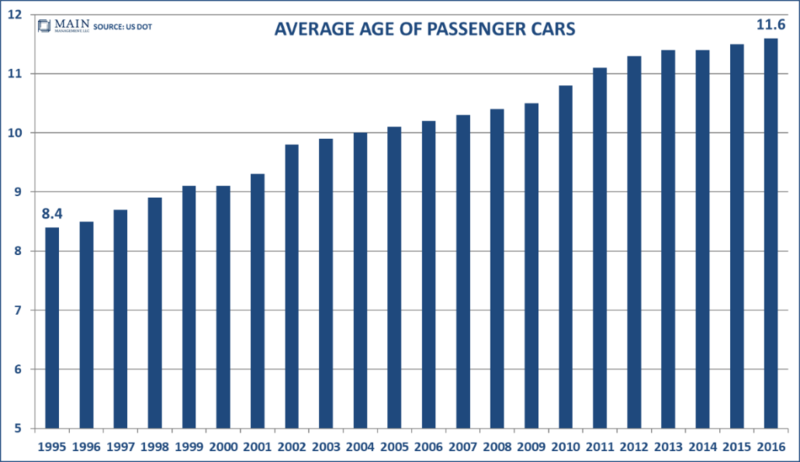 From there, trends went sideways and more recently, there has been an 8% decline to a run-rate of 16.6 million vehicles currently. Further sales declines and production cuts are estimated for the remainder of 2017. After the economy bottomed in mid-2009, the stars were aligned for a meaningful rebound in the auto sector. 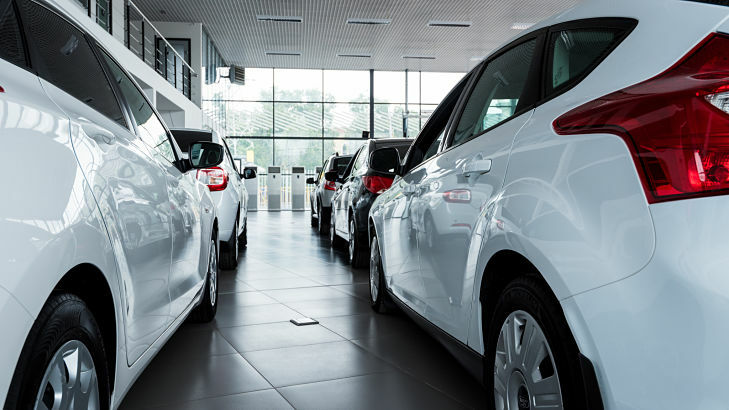 A combination of an improving economy, low interest rates, the average age of passenger cars, low gas prices, and attractive rates all added to the mix. Lenders became competitive in their pursuit of new auto loan customers as some of the Dodd-Frank regulations made other lending areas more difficult (think mortgages). 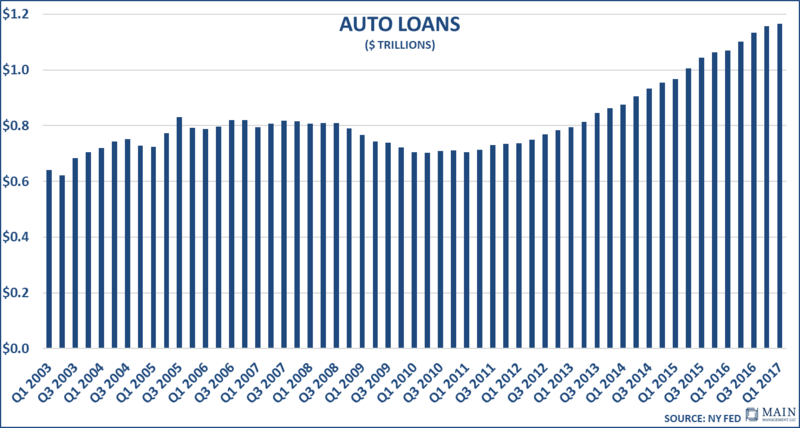 Consequently, auto loans grew very quickly and now total close to $1.2 trillion, which is 13% above pre-recession levels. To attract more business, lenders dropped their rates and extended the duration of the loans out to an average of 69 months (some have now extended as long as 84 months). Even technology had an impact on the sector as devices could be placed in cars to disable the vehicle if borrowers fell behind in payments. That element gave lenders more confidence to broaden their customer base as they felt that the overall risk was reduced. As a result, loan totals ballooned and now exceed total credit card loans.